Crystal Bridges Museum of American Art, located in Bentonville, Ark., announces a series of new acquisitions of works by artist Andy Warhol that includes two gifts and a recent purchase. The works are exhibited, together with works already in the Crystal Bridges collection, in the museum’s Twentieth-Century Art Gallery. As a counterpoint to this iconic signature image, the second of the recent Warhol acquisitions presents Warhol at an earlier stage. The untitled work, depicting a sleeping woman and man, was created by Warhol as a student at Carnegie Institute of Technology (now Carnegie Mellon University) and has been in a single private collection. A classmate of Warhol’s, Martha Sutherland, purchased the painting directly from the artist in 1949, when he still went by the name Andrew Warhola—the work is signed on the reverse with “WARHOLA” in pencil. Since 1958, Sutherland has kept the painting in the Arkansas home that she shared with her late husband Cyrus, professor emeritus of architecture at the University of Arkansas Fay Jones School of Architecture and leader in the movement to preserve Arkansas’ historic buildings. She and her family made the decision to donate the work to Crystal Bridges because they felt strongly that the painting should be publicly seen and appreciated. The Bachman Wilson House Somerset County, N.J. Crystal Bridges Museum of American Art in Bentonville said Wednesday that it has acquired a Frank Lloyd Wright Usonian house, known as the Bachman Wilson House, in Somerset County, N.J. The museum plans to move the house to the museum grounds in Bentonville. The house is now in Borough of Millstone in Somerset County, N.J. It was built in 1954 along the Millstone River, which over the past decades has begun to threaten the home. Site preparation will begin this spring. The museum hopes to complete the project by "early 2015." Crystal Bridges said The Frank Lloyd Wright Building Conservancy of Chicago and the Borough of Millstone Historic District Commission in Millstone, N.J.. both support the plan. The museum did not disclose financial details of the deal. In February, the house was on the market for $1.5 million. "Due to repeated flooding, the house has sustained significant damage and relocation has been recommended as a means of best preserving the structure," the museum said in a news release. "The owners conducted a multi-year search for a purchaser that could provide an appropriate setting and context for the historic building. 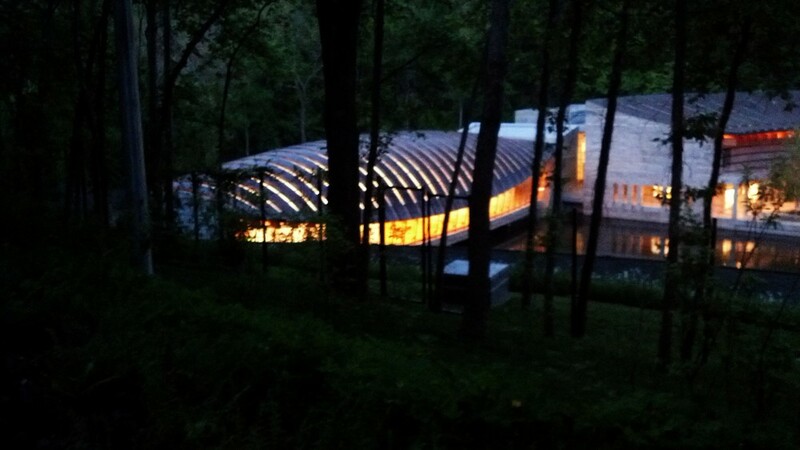 Crystal Bridges has now acquired the home, which will be disassembled and moved to Bentonville. There, it will be reassembled on Crystal Bridges’ 120-acre grounds." Once on the grounds, the house will be available for study, limited programming and tours. 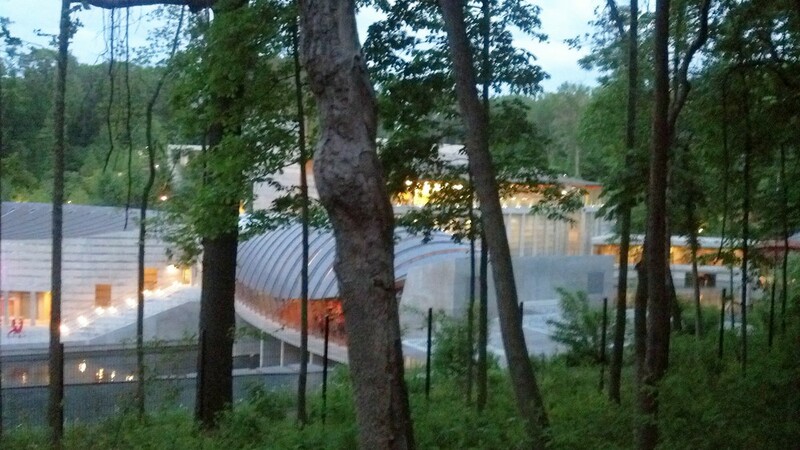 Crystal Bridges said the house will enchance its educational and public program offerings. "We're honored to be able to preserve and share this significant example of American architecture, as Frank Lloyd Wright's work embodies our own mission of celebrating art and nature," Crystal Bridges Executive Director Rod Bigelow said. "The Usonian concept was intended to provide access to architectural quality for all families, which melds well with our philosophy of welcoming all to view American masterworks in our natural setting." Crystal Bridges says that J.B. Hunt Transport Services Inc. of Lowell has "donated its services" to bring the house to Bentonville. "We are honored to be a part of such a monumental effort to save one of America's truly iconic structures," John Roberts, President and CEO of J.B. Hunt, said in a news release. "We are pleased the house will settle within our area's natural beauty and provide such valuable educational opportunities." Abraham Wilson and his wife Gloria Bachman commissioned Wright to design their home in 1954. The museum said the home is reflective of Wright’s Usonian period, "a work of art in simplicity and form, representing organic design principles." The home's recent owners, the architect/designer team of Lawrence and Sharon Tarantino, purchased the house in 1988. They restored the house, an effort that received multiple awards, including the 2008 Frank Lloyd Wright Building Conservancy Wright Spirit Award. But flooding from the nearby river has continually threatened the home, leading the Tarantinos to put the house on the market in 2012. The sale was conditional upon moving the house to a suitable natural site. "It became clear that there could be no better opportunity for the preservation of this important work of Frank Lloyd Wright than to secure its future stewardship in perpetuity at a public institution with a mission of celebrating American art and architecture, on a site offering the proper setting, and with the capability of providing for its future maintenance and preservation, all of which Crystal Bridges offers," Lawrence Tarantino said in a news release. The sale of the house includes all the fixtures and furniture designed for it. The museum said it will use a specialized contractor to dismantle the house. Once at the museum, it will be reconstructed to Wright's original specifications. The house will be sit a short distance from the museum along its 3.5 miles of trails. March 9th through May 27th, 2013 the Crystal Bridges Museum of American Art will host an exhibition entitled American Chronicles: The Art of Norman Rockwell. The cost of admission is $12 for adults, free for folks under the age of 18. One of the most popular American artists of the past century, Norman Rockwell (1894-1978) was a keen observer of human nature and a gifted storyteller. This traveling exhibition features 50 original paintings and 323 Saturday Evening Post covers that document Rockwell's engagement in American life in all its glory and tragedy over five decades. The exhibition also includes materials from the Museum's archives demonstrating how Rockwell worked: proceeding from preliminary sketches, photographs, color studies, and detailed drawings to the finished painting. Timed, reserved tickets will be required to view this exhibition. Guests visiting American Chronicles: The Art of Norman Rockwell may be interested in the accompanying audio tour. Two different tours are available on each iPod Touch device – a 45-minute general tour, and a 30-minute tour that’s great for families and children. Guests holding tickets for this special exhibition can pick up an audio tour at the gallery entrance at no charge. Crystal Bridges’ Gallery Guides are available to enrich your experience of the temporary exhibition American Chronicles: The Art of Norman Rockwell. On weekends, the Museum’s trained Guides will be stationed throughout the exhibition to answer your questions and provide additional information. Look for Guides wearing colorful “Ask Me” buttons in the exhibition. American Chronicles: The Art of Norman Rockwell was organized by the Norman Rockwell Museum, Stockbridge, Massachusetts. 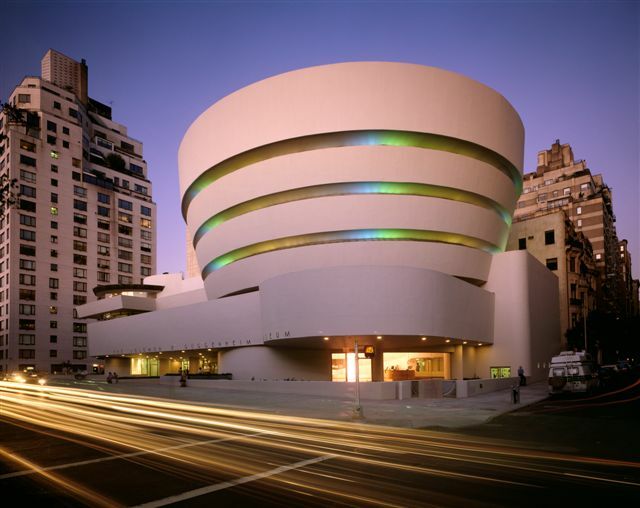 This exhibition is made possible with the generous support from National Endowment for the Arts, American Masterpieces Program; the Henry Luce Foundation; Curtis Publishing Company; Norman Rockwell Family Agency; and the Stockman Family Foundation. Crystal Bridges Museum of American Art on Thursday announced plans to exhibit rare early American documents, including "one of only 25 known existing copies of the printed broadside version of the Declaration of Independence." This temporary exhibit at the Bentonville museum is scheduled for June 30 through Sept. 3. "The broadside was like the radio or internet of its time," David Houston, director of curatorial at Crystal Bridges, said in a museum statement. "It was the fastest, most technologically advanced method available of disseminating information during colonial times. Broadsides were sent to each of the colonies, and read aloud in public along the way for everyone to hear. It was the closest thing they had to mass communication." "On the evening of July 4, 1776, the text of the newly penned Declaration of Independence was typeset in the Philadelphia printing shop of John Dunlap and 200 large-format 'broadside' copies were printed," the museum said. "These were rapidly distributed throughout the colonies to inform them of their new independence. "Though it is not the famous hand-written version of the Declaration, and bears no signatures, the Dunlap Broadside was, in fact, the first published Declaration of Independence to be distributed to the colonies. The 'official' handwritten document, which is on permanent view in the National Archives in Washington, D.C., was probably not signed until August, 1776." Two printed newspaper accounts from 1776. A handwritten letter from King George III to his generals. A printed edition of the Virginia Bill of Rights. And the Franklin printing of the Treaty of Paris, which ended the war between England and the United States. No special tickets are required, the museum said, and viewing the exhibit, "Declaration: Birth of America," is free. But space is limited in the exhibition area, and admission is on a first-come, first-served basis. 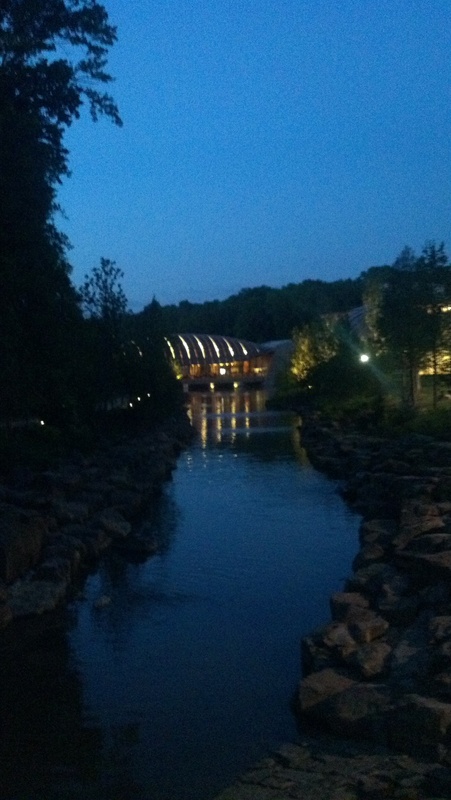 Members of Crystal Bridges will receive a special preview of the exhibition from 9 a.m. to 9 p.m. June 29. For information on becoming an original member of Crystal Bridges, visit crystalbridges.org/Membership. Mary and I took a walk on the Crystal Bridges trail yesterday because the mild weather made it feel like spring...everything is starting to try and set blooms. Hope it doesn't freeze back. There were literally hundreds of people walking the trail, walking their dogs, or just enjoying the day. The Compton Gardens lot was almost full and the museum lot was also full. I saw several people carrying Museum Store sacks and heard a few folks who had accents that were of an international flavor...proof that the museum is drawing visitors from all over the world. I imagine that this will always be the case, although I have heard some speculation otherwise. I believe that the museum will draw people from around the country and around the world from here on out. The new overlook was completed just this month - no more wooden platform but a real flagstone tiled rest area with flagstone bench seats...a beautiful addition to the trail. I can only imagine what warm weather will bring...if you are reading this and haven't been yet, plan your trip today...you don't know what you are missing! The Crystal Bridges Museum of American Art has opened here on 11-11-11 with stunning American Artwork dating from the 17th century to the present day with such diverse artists as Charles Wilson Peale, Norman Rockwell, John Singer Sargent, Andy Warhol, Andrew Wyeth, Gilbert Stuart, and much much more. 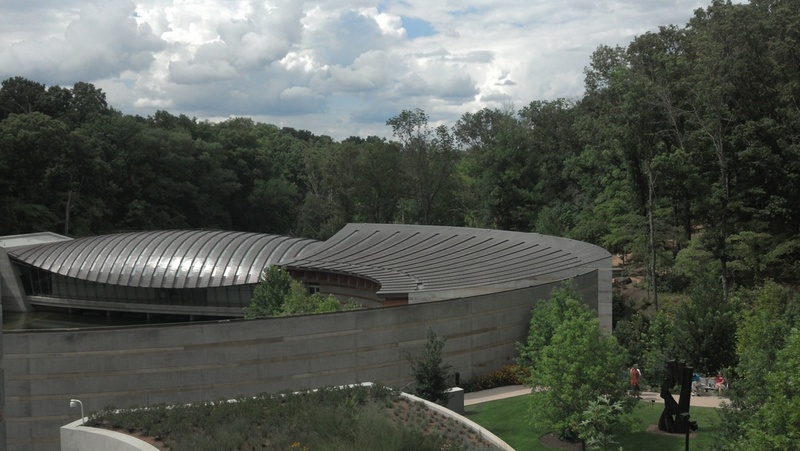 For more information about the museum, please visit their website at www.crystalbridges.org and don't forget to come back here for more Bentonville history and information!